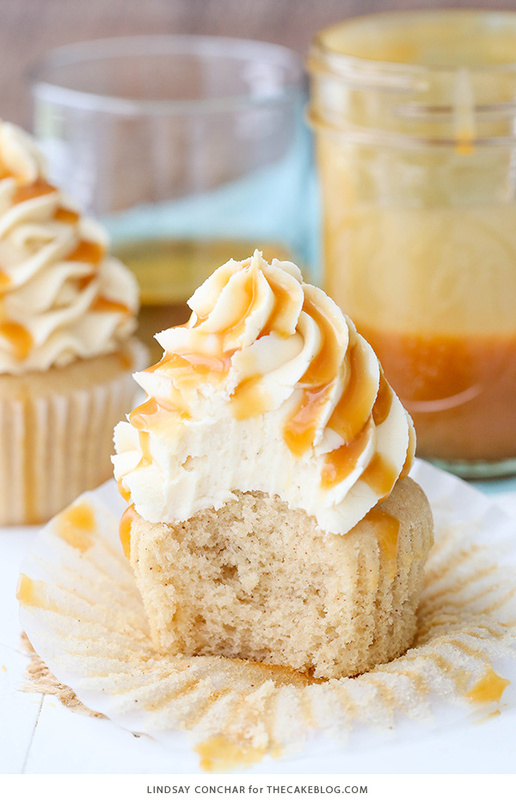 Caramel Bourbon Vanilla Cupcakes – a brown sugar bourbon cupcake topped with caramel vanilla frosting for a unique combination that is full of flavor! 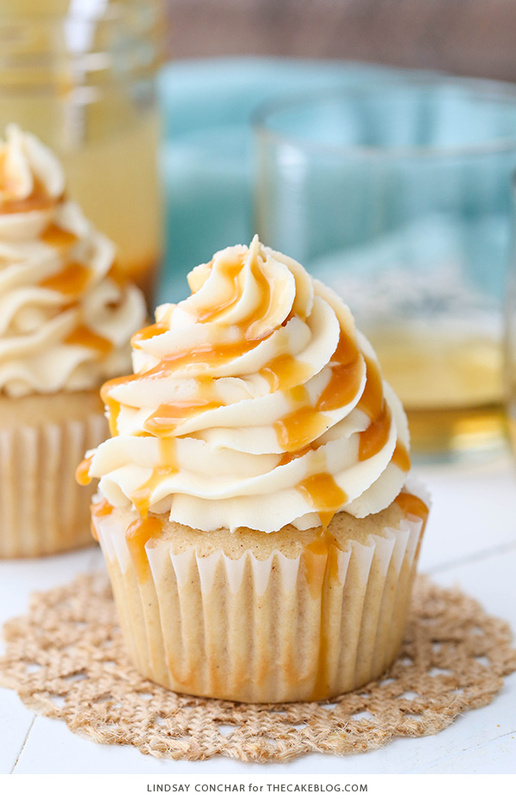 A new cupcake recipe by our contributor, Lindsay Conchar. So I’ve never really considered myself much of a drinker. While I love a good cocktail when hanging out with friends, particularly now that it’s summer, that’s mostly it. Plus, I tend to not like to drink my calories, I’d rather eat them. So when I have the chance to combine eating my calories in cupcake form with “drinking” them too, I’m on board! Ha! No but truly, there’s something about the flavor that most alcohol gives to baked goods that I just love. It’s like beer in cheese – how can you go wrong? Bourbon is one of my favorites. I don’t personally drink it, but it gives a really awesome spiced flavor to things. I love it! I also added brown sugar and a bit of cinnamon for some additional flavor to go with the bourbon. The cinnamon may seem like an unusual addition, but I find that the smallest amount of it can add a really nice bit of flavor and accentuate other flavors nicely. There’s not a lot in the cupcake, but it’s just enough to add to the spiced flavor of the cupcake without overpowering the bourbon. 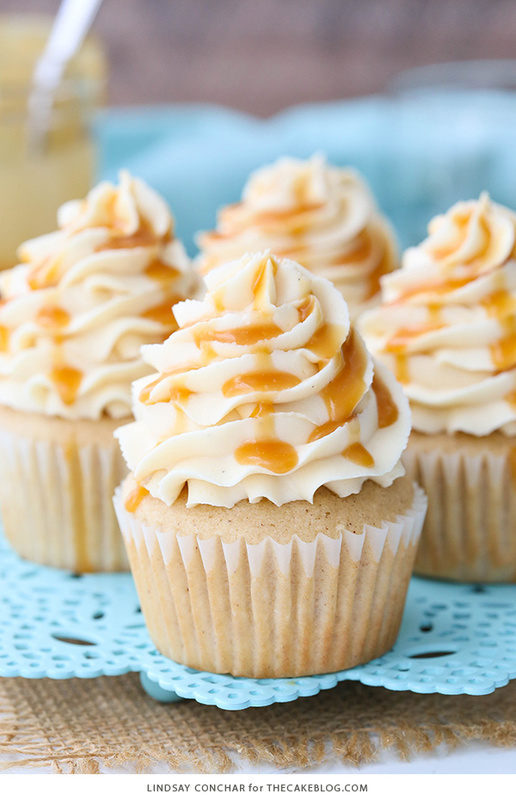 For the frosting I used my favorite caramel sauce, but you could certainly use a different one. 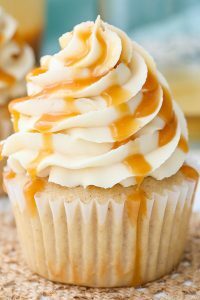 Just keep in mind that not all caramel sauces are the same consistency, so if yours is thinner you might want to use a little less than I did so you don’t thin out your frosting too much. I also used a bit of vanilla bean paste in the frosting to bring out a little more of the vanilla flavor and add some fun specks to the frosting. There’s not a ton of it, but you could certainly add to it if you like. 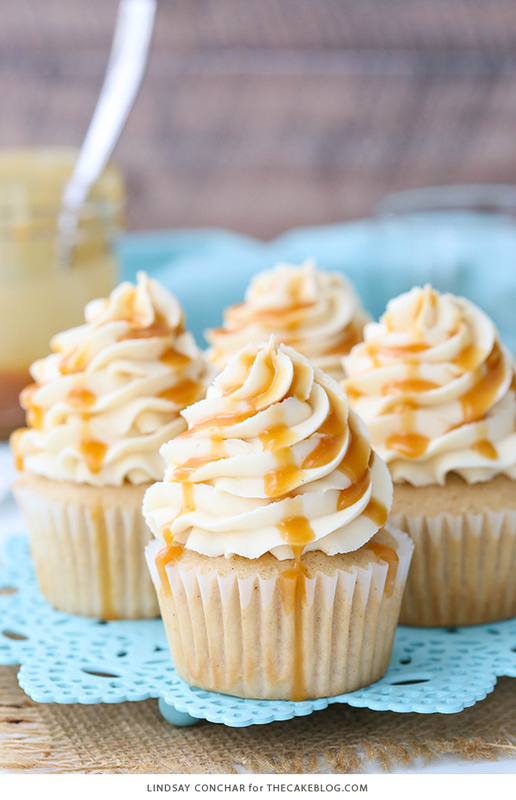 These Caramel Bourbon Vanilla Cupcakes are full of flavor! 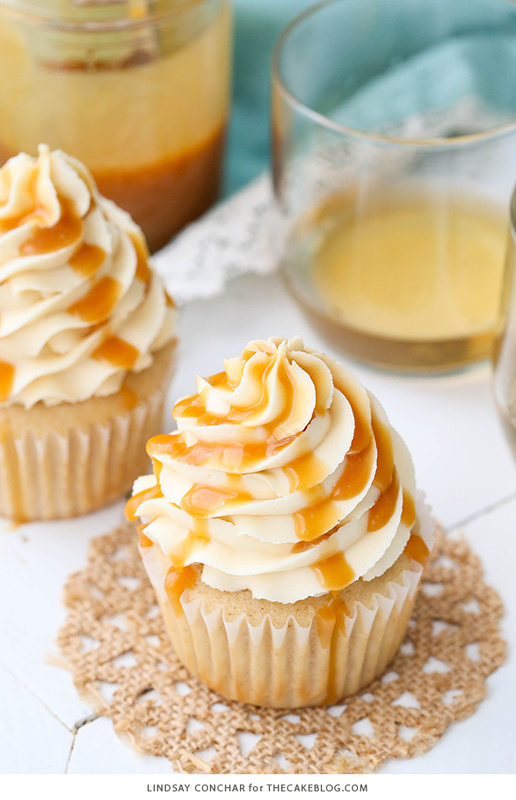 A brown sugar bourbon cupcake is topped with caramel vanilla frosting for a unique combination that you will love! In a large mixing bowl, whip together the butter and sugars together until light in color and fluffy, about 3-4 minutes. Do not skimp on the amount of mixing time. In a separate bowl, whisk together flour, baking powder, salt and cinnamon. Set aside. In a small measuring cup, combine the milk and bourbon. Set aside. Add half of the dry ingredients to the batter and mix until well combined. Add the bourbon mixture and mix until well combined. Add remaining dry ingredients and mix until well combined. Scrape down the sides of the bowl as needed to be sure all ingredients are well incorporated. Fill the cupcake liners about halfway. Bake for 14-16 minutes, or until a toothpick inserted comes out with a few crumbs. To make the frosting, add the butter to a large mixer bowl and mix until smooth. 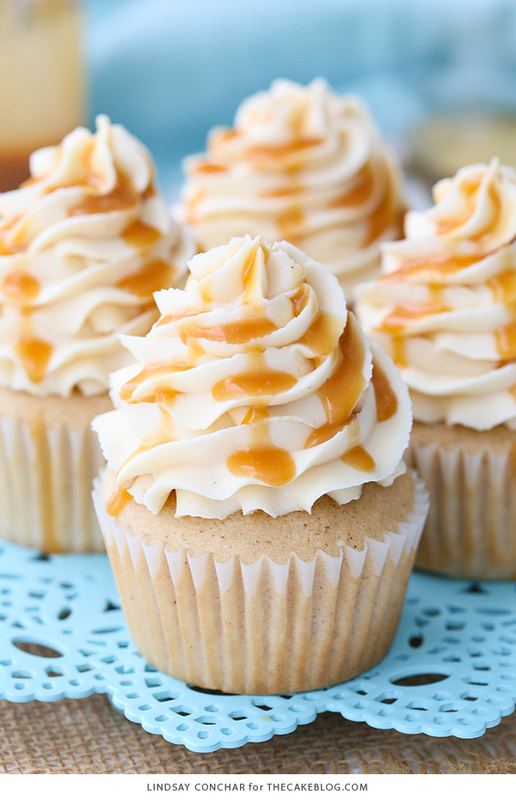 Add 3-4 tablespoons of caramel sauce and the vanilla bean paste to the frosting and mix until well combined. Add additional caramel sauce as needed to get desired consistency. Pipe the frosting onto the cupcakes using a large open star tip. Drizzle with additional caramel sauce as desired. I m searching for cakes for my girlfriend birthday and here I found one with an awesome recipe she loves cupcakes. thanks for sharing the recipe with instructions. Thanks for the recipe. First time baking with bourbon. Our cupcake texture was a little on the “springy” side, almost like a sponge cake, so I’m wondering if that could in any way be related to using bourbon? Thanks again. Absolutely delicious and very unique. My twins are requesting them for their 13th birthday celebration! You are my inspiration just loving your work. 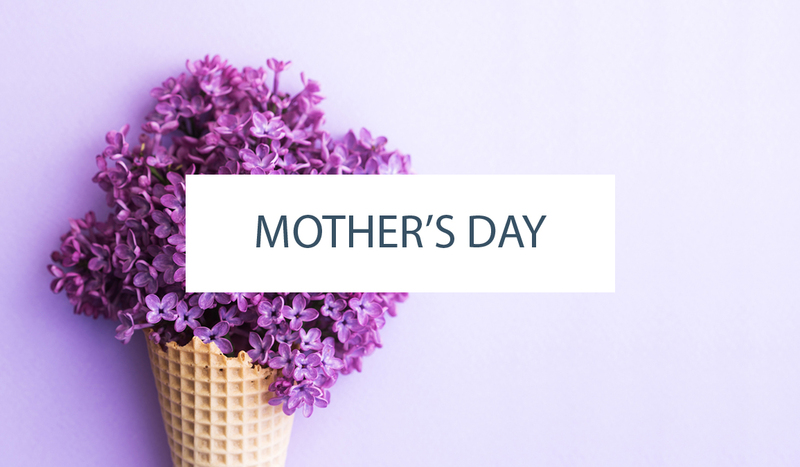 Thank You so much for this amazing Tips and Recipes. Any tips to make this a bundt cake?